Help control portion sizes and costs with the Choice 2 oz. 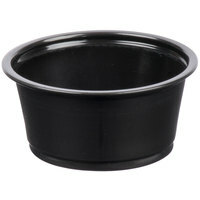 black plastic souffle cup / portion cup. This versatile cup is great for salad dressings, condiments, sauces, and samples. The sturdy, crack-resistant polypropylene construction offers durability to provide you peace of mind when serving your customers. Unlike comparable paper cups, this plastic cup is able to withstand commercial use without worry of punctures or leaks. Great quality and very sturdy. Love the black color, very happy with the product. Lid snaps on perfectly also. Overall, great price and great quality! Great quality. Easy to use and store. Appropriate for all serving and catering needs. Highly recommended. We use it for our sample servings in the store. These work just great ! Nothing to worry about in terms of quality or how good they work. Material and look is the same to any other brand item. Nice buy ! Although it is a great container and we use for condiments, next time I order again I will go a size up for things like salad dressings and syrups. LOVE these souffle cups! We use them in house for our sauce portioningserving. The Black fits perfect with our restaurant, as our colors are black, gold and white. Choice products are always sold at a reasonable price. The 2oz cups we purchased looks very good and if we compare it to the more expensive ones, there isn't much of a difference. I am a personal chef and have a keto/low carb style individual meal prep service. These are the perfect sized, leak proof containers for sauces and condiments. I use these cups (and corresponding lids) to separate my super mealworms. They are durable, opaque, and the lids pop right on, unlike cheaper souffle cups found on another site. I recommend these to anyone else farming super mealworms! This plastic soufflé cup is amazing. It holds just the right amount. It comes in handy when dipping sauces. I would highly recommend this product. I would give this product 5 stars, but the missing star is due to the portioning cup not holding up for hot liquids. We serve hot beer cheese with our soft pretzels, and this cup does not do well with the hot cheese. Other than that, would recommend purchasing. Much lower price than regular food vendor and great product. Quick ship of all products from web restaurant. Would recommend this product to all that is in the food business. We use these every day. They are a good thickness and pair well with the lid for to go orders. They keep things dry in a bag and refrigerate well. Very sturdy product. Lids seals nicely. Perfect portion size for to go salad dressings and sauces. Priced well for product. Our restaurant uses these daily. The Choice 2 ounce black plastic souffle cup is very good size and durability for sauces and their condiments restaurants would like to use and put on the site of Dishes. Sleek black look and very durable. We love these to-go portion cups. Much classier than the clear ones and the lid stays on well too. Will be re-ordering these when necessary. These choice 2oz soufflé cups work great for your restaurant for your dipping sauces or toppings. The lids work great and are a secure fit. We like these stylish black cups for our dressings and sides that we serve. Looks great even for our dine-in guests and great for our carry out salads. Great durability and consistent true color. Perfect for to-go use or quick service items. Great price! Switched from Gordon’s products because of the competitive price and it ended up being a better product!! These portion cups are a little flimsy, but they definitely serve their purpose. Good for the price. Would use for sauces but nothing more liquid. Sometimes small things can save life. This one is like so. Great solution for portion control exactly When you close it with a suitable lid. This has been a good quality Souffle cup for us, we wanted the black coloring to go with the look of our restaurant and it works well. Less than half the cost of the brand we were getting from our local distributor and the same quality. Lids don't work with the other brands as we were trying to use up remaining product, but for the cost savings, and the fact that lids can be purchased in smaller quantities this product has replaced our previous brand. Perfect! Exactly what we were looking for! These choice 2 oz to go cups are perfect for the portions we were looking for for our to go sauces. They are quality. We use lots of these at my bar for sauces, both in the restaurant and for takeout, and they’re great! They’re sturdy enough to be useful and they look good, plus the price is right! Love these little cups. Nice sauce cups. It’s a nice black sturdy plastic so it helps to make my sauce that much more appealing and it is. Perfect size soufflé/portion cup by Choice. Great for condiments, dressings, or salsa. Snug fit with the lids, classic black design, and nice price. Highly recommend! Souffle cups were the perfect size for our condiments. We were wasting too much before we got these, and now it's easy to toss one in our food baskets on our way out to the hungry customers! We were buying these at our local restaurant depot store and thought we were getting a great price. These are less expensive and of comparable quality. We decided to order these black portion cups instead of the clear ones, we think they just look better. We serve our barbecue sauce in these as well as portion condiments for to-go orders. I bought these because I am just tired of seeing the clear ones at every establishment I go to LOL!! However, don't be like me and forget to order your lids, they do come separately. These are the perfect size for a healthy portion of any condiment. These souffle cups were the EXACT same in quality and size as other brands but about half the price! They are even compatible with the surplus of extra lids we had from the pricier brand. Would definitely recommend! Really recommend, perfect portion cup gives us quality, presentation, good look food, perfect to serve our hamburguers, boneless, or wings sauces. really strong, and the perct black color. These cups are a few dollars more than the clear cups but look so much better. I have not received any negative quality feedback from my customers. Great product! We used to use a clear cup but we wanted to swap to black but we could not find any that were reasonably priced. Thankfully Webstraunt had them for great prices! We use these cups for all our dressings for our take out business, They are equal quality of the big guys and much much cheaper! These are exactly what I needed to put dips in for snack meal planning. The lids are nice and tight and great to put Ranch or fruit dip in to snack in while at work. They fit inside my 12 oz choice takeout container making it really simple to make ahead of time and grab when needed. even hold up well to be being frozen. We use this soufflé cups for our salads, and also if a customer wants their dressing for a sandwich on the side. These are sturdy, look very nice, and are a good price. Super classy and sturdy. I use them for holding sauces for dinner service. The black color looks very elegant. And when paired with a clear lid you can see the contents. Pretty good product. Not super thin and cheap like some of the portion cups out there. Fits with every lid we’ve tried so far without any problems. I just thought of buying this and give it a try I would it very works perfectly when ever i could something with sauce i would always use a lot of sauce some times i won't so there will be some left amount of sauce left so i put it in this Because this box consumes less space i like this one a lot. We use the 2 ounce plastic cups for a wide variety of things. We can use them for house made beer queso, or putting a specific ingredient on the side if a customer doesn't like something. These 2 oz. black plastic cups look nice and are very affordable and made of durable plastic that is both BPA free and recyclable. If you would like to use these to-go, you can purchase the corresponding lid. Fantastic little sauce cups are great for dressings, sauces, and condiments. The lids snap on easily and have a tight seal, no leaking and keep salads and meals fresher by separating the two. The 2 oz. size is nice, enough dressing for a whole salad. I also like to put spicey items in them, like peppers or jalapenos which gives people the option to use or not use them, with the juices getting all over the main dish. This made of good quality of plastic. I used this for dressings to go and also for samples like candies and nuts. Worth the money! These portion cups are nice. I like the way the black cups look much better than the clear. Definitely more modern and sleek. These are winners. We use these portion cups for our lounge area, large banquets, and takeout orders. The black color adds a level of sophistication, so they still look nice to use in our lounge and banquet rooms. They are sturdy, and easy to store. Very good product. These portion cups are perfect for dressings and dips. Full case of 2500 cups is a great value. Matching lids are also available for take out orders. This 2 ounce portion cup by choice is a great product for any bar or restaurant. Perfect size for a side of dressing or ketchup. This size is perfect for serving ketchup, mustard, mayo and hot sauce on my food trailer. And did I mention the price? This site is by far the BEST price I have found for the quality.